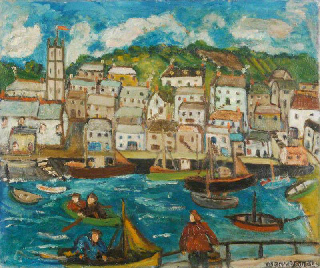 We have Chris O'Brien (a Subscriber to my Blog) to thank for introducing us to Mary Jewels, a Cornish artist and a member of the Newlyn art colony. The painting colony at St Ives, Cornwall seem to have received more publicity so it is wonderful to learn about their Cornish cousins on the south coast who were painting a good while before those at St Ives. And my research has lead me to discover that the Penzance School of Art was established in 1853, long before either of these other two communities got going. 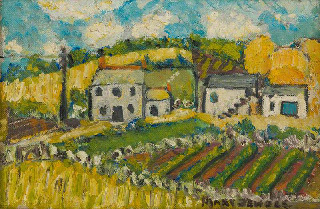 However, two of Mary's paintings I found demonstrate a very different and more sophisticated style, possibly done later in her life. Each shows her experimenting with images and moving towards an abstract style. 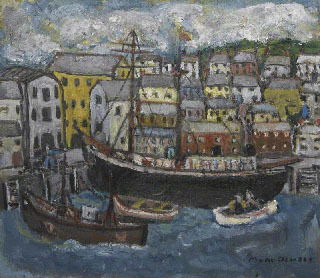 Mary considered herself to be a Newlyn painter, being born there to Irish parents. However little local interest was shown in her work and I gather from my research that she might have been overshadowed by the local interest in Alfred Wallis (see Blog 17 January 2018). However she first exhibited in London in 1928 perhaps helped by her friends Augustus John and Dod Procter (born Doris Shaw 1890 - 1972) both of whom were professional artists and very well known in London circles. It is also possible that she didn't play the "right game" to gain local patronage as she said she didn't particularly like Alfred Wallis and from my reading I get the impression she might have been somewhat cantankerous being described by one writer as a "stormy petrel". There can be no doubt that Mary Jewels was a talented artist. She has even been called the 'English Van Gogh' arising from her painting "Cornfields with peasants". Unfortunately I haven't been able to locate an image of this painting for us to see. 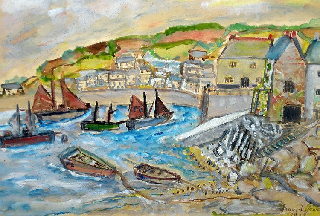 As she lived such a long life she certainly got to observe and no doubt enjoy the development of the Cornish artists. 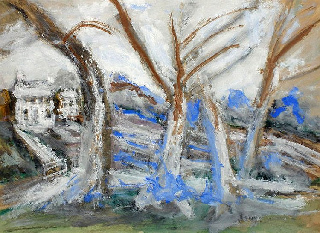 She is reputed to have influenced the work of Christopher Wood whom we reviewed in the Blog (19 January 2018). 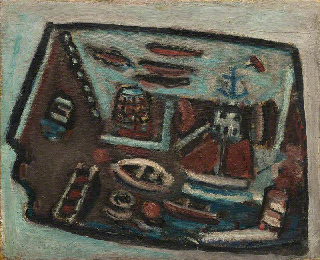 A Solo exhibition of her work was held in Newlyn 1977, the same year in which she died. Tomorrow we will look at the painting of cornfields which has grabbed my curiosity since looking for Mary's painting of cornfields.